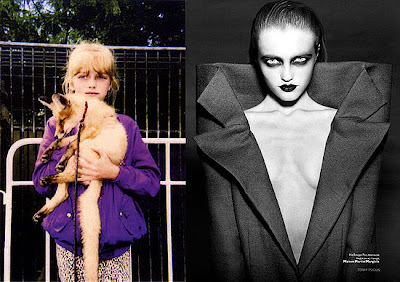 No ugly duckling phase for these Russian supermodels apparently! 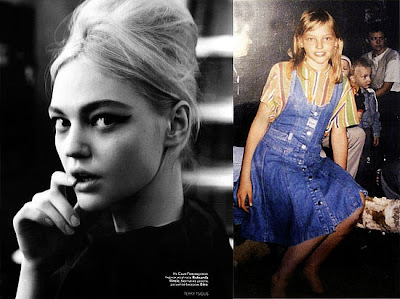 The September 2008 issue of Vogue Russia cleverly juxtaposed current photos (taken by photographer Terry Tsiolis) and childhood photos (sent in by the girls' parents) of the Russian greats like Sasha, Natalya, Snejana, Anna and all those names ending in "a"! Looks like they were born to model! And that I was born to blog about this, hahaha! It's like they were BORN to models. 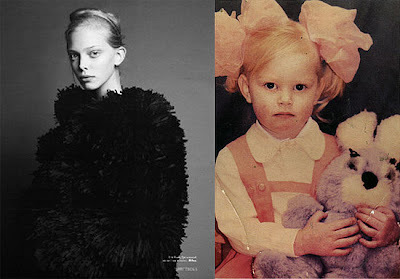 That Anna Selezneva looks exactly like my Latvian roomie. 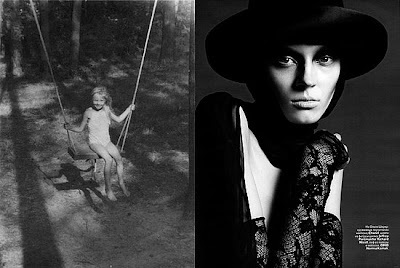 There's something a little tragic in the eyes of these Russo/Baltic beauties. hahaha. their names do all end with -a! hi mfo! where are good fashion haunts in hk? nice but affordable clothes and accesories especially ballet flats? also which mall houses the most variety of branded boutiques to window shop and buy an expensive piece or two? thank you for your help. I noticed that too vanessa! Quite haunting no? I'll get back to you on that anon!